School is back in full swing and so are most extra-curricular activities. To parents this means lunch boxes, uniforms, homework, and lots and lots of rushing around. So week-night meals need to be kept simple. And you don’t get much easier than a Crockpot meal, just chuck it all in, turn it on and inhale the aroma that will fill your house for the rest of the day. Sometimes I find Crockpot recipes include ingredients I prefer not to use (like cans of soup) or ones I simply can’t find in the stores so I tend to take the ingredients I love to use and come up with my own concoction. This is one of those recipes. Place the roast in your crockpot and lay the onion slices on top. Combine the remaining ingredients in a bowl and stir to combine. Pour sauce over the top of your roast, place the lid on your Crockpot and let it work it’s magic on LOW until the meat is cooked through. Once the meat is cooked through, remove from the Crockpot to a large pan or cutting board and shred using two forks. 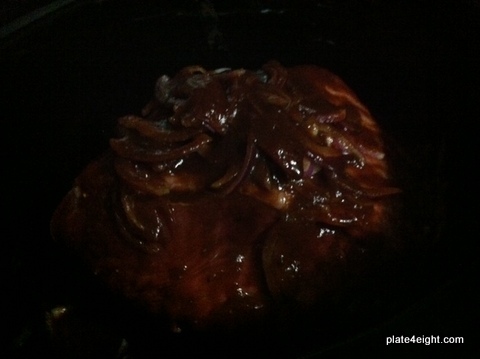 Place meat back into the juices in the Crockpot and keep on WARM setting until needed. Remove meat from juices just before serving. Notes: Again, this is one of those times that you need to go by how fast you find things cook in your Crockpot. Mine cooks things faster than most (which I’m not fond of, but it’s what I’ve got right now, so I’m using it). My Crockpot took about 5-6 hours to cook this roast on the LOW setting, but others may take 8-9 hours.